Out of the income there is set aside a fund for depreciation, and the expenditures are economically maintained at 40% of the net income, partly by reason of the simple character of the equipment and the absence of generating machinery. Under these circumstances its return of 4.7% upon the invested value makes it an effectively productive investment, as a mortgage at the same rate as in the foregoing instance would leave an attractive return upon the equity. An instance of a return of a rate less than current mortgage interest is that of a high-class office building, twenty stories high, of a total appraised value of $4,500,000, the total rentals of which are, however, only 7% of the appraised value. This building has a complete power-generating plant, and is operated at a cost of 48% of its income, returning upon its capitalized value only 3.6% interest. 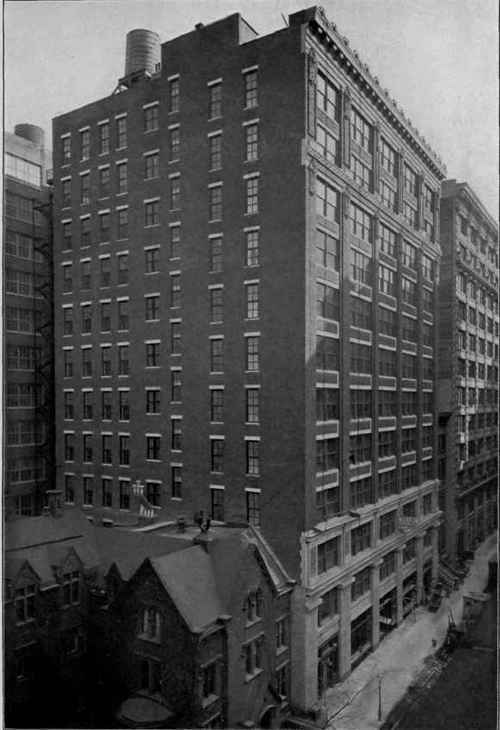 A smaller modern office building of about one third the size of the foregoing, of fourteen stories height, having an appraised value of $600,000, brings a rental of 10% thereon, and returns a net interest upon the investment of 4.8%, in spite of a proportion of expenditure to income of very nearly 50%. "It is an open question whether the majority of city buildings would not gain by a substantial reduction of the ratio of the area of the building to the area of the lot"
Values Established by Buildings by public supplies of power and heat, and is operated for a total proportion of 47.5% of the total rentals. These instances appear to indicate that in certain cases the relation of the building to the land, both as regards height and as regards expense of construction, has not been happily proportioned, and thus the return upon the total invested capital has been proportionately reduced. But where the initial cost has been moderate, and unnecessary expenditures in construction, in equipment, and in operation have been avoided, the net returns upon such investments, while they may be less than those afforded by other classes of buildings, are acceptable to conservative investors, in view of the attractive solidity of the investment. Passing to other classes of buildings of which similar statistics are available, it will be found that the returns are somewhat more irregular than in the case of office or business buildings. Where buildings combine simple character, moderate cost of construction, and moderate extent of mechanical service with a location in which land values are comparatively low, we may expect to find a growing advantage as regards the net return upon the invested value. This is usually the case with loft buildings of simple semi-fireproof construction, generally situated in neighborhoods off the main arteries of traffic, and equipped with very simple forms of conveniences. In such properties the gross rentals approach one tenth of invested values, and, with expenditures below 40% of rentals, will show returns exceeding 5%. Rentals of value . . .
To maintain the book value of the properties cited, at a rate of return of 8%, with operating expense not exceeding 50% of gross income, the rent must be raised to 63 cents, 73 cents, 83 cents, and 92 cents respectively. Operating expense . . . Rents to value, only . . .
Return on value, only . . The invested value is too high for such a class of property, but on looking into details we find the cause in great part to be that the building is overtaxed, paying 20% of its gross rentals in taxes. If this expenditure were reduced to the level of others in a similar class of property, say 14%, the return would be raised to 4 1/2%, but the invested value might still be scaled down about 12% to make a return of 5% . The term "loft building" has been extended to include the modern class of 12-story fireproof building occupied chiefly as warehouses, show-rooms, or for very light manufacturing purposes. These buildings are attractive for such purposes, by reason of their superior light, generally gained by their location in neighborhoods occupied by buildings of a few stories; an advantage which is frequently liable to be discounted by the growth of neighboring buildings of equal height. As it is, they secure rentals on a somewhat higher scale, and having the same characteristic of moderate cost and operation, they show very gratifying returns. A recently completed building of this order is leased to one tenant at a rental equivalent to 11% of invested value, and, with operating expense of 40%, will show a return of 6 1 /2% on the investment. In the residential class of building we find a set of conditions differing from both of the other classes of commercial buildings. An overwhelming tendency has brought about a demand for apartments, which has been responded to by an almost confusing variety of forms of structure. In certain favored localities a fashionable demand has forced the marketable value of land upward, and in others the mere crowding of population has effected the same result. The class of building erected on these sites is, however, very different, in the one case being an expensive construction with expensive accompaniments of operation, and in the other the cheapest class of construction and almost entire absence of conveniences. Rent per gross sq. ft.
At the lower part of the scale, the so-called "cold-water" tenement has attracted a vast number of small investments, on which the returns have been attractively high, and the demand for accommodation so great as to insure regularity in tenancies.